Text 1: Fawkes, at his Booth over against the Crown Tavern, near St. George’s Church, in Southwark, during the Time of the Fair, will perform the following Entertainments.-1. His surprizing and incomparable Dexterity of Hand, in which he will perform several intirely [sic] new Curiosities, that far surpass any Thing of that Kind ever seen before.—2. A curious Musical Clock, that he lately purchased of Mr. Pinchbeck, Clock-Maker in Fleet-street, that plays several fine Tunes on most Instruments of Musick, and imitates the melodious Notes of various Kinds of Birds, as real Life: Also Ships sailing, with a number of curious and humourous Figures, representing divers Motions, as tho’ alive.—3. Another fine Clock or Machine, call’d Arts’ Masterpiece, or the Venetian Lady’s Invention, which she employ’d Workmen to make, that were 17 years contriving; the like of which was never yet made or shown in any other Part of the World, for Variety of moving Pictures, and other Curiosities.—4. A Famous Tumbler, just arrived from Holland, whose Performances far exceed any Thing of that Kind in this Kingdom.—Also his little Posture Master, a Child of about five Years of Age; that performs by Activity such wonderful Turns of Body, that the like was never done by one of his Age or Bigness before. THIS wonderful Machine is the Astonishment of all that see it, the Magnificence of its Structure, the Delicacy of the Painting and Sculpture, and the great variety of moving Figures makes it the most surprising Piece of Art that has ever yet appear’d in Europe. It represents a Landscape, with a view of the Sea, terminating insensibly at a vast Distance : With Ships sailing, plying to Windward, doubling Capes, and diminishing by degrees till they disappear. Swans in a River fishing and pluming themselves; Duck Hunting to Perfection, and great variety of other Motions. Likewise another beautiful Picture, representing ORPHEUS in a Forest playing among the Beasts. Here the very Trees, as well as Brutes, are seen to move, as if animated and compell’d by the Harmony of his Harp. It also performs on several Instruments great variety of most excellent Pieces of Musick compos’d by Mr. HANDEL, CORELLI, ALBINONI, BONOCINI, and other celebrated Masters, with such wonderful Exactness, that scarce any Hand can equal. It likewise imitates the sweet Harmony of any Aviary of Birds, wherein the respective Notes of the Nightingale, Woodlark, Cuckoo, &c. are performed to so great a Perfection, so as not to be distinguished from Nature it self. With several other grand Performances too tedious to mention, Prices 5 s. 2 s. 6 d. and 1s. To be seen from 10 in the Morning till 10 Night, by two, or more, without loss of Time. Note, This curious Machine will be removed in a few Days next Door but one to the Leg Tavern in Fleetstreet. Comments: ‘The Grand Theatre of the Muses’ and ‘Venetian Lady’s Machine’ were the creations of Christopher Pinchbeck, a clockmaker and maker of mechanical automata. He collaborated with the conjuror and showman Isaac Fawkes, notably at Bartholomew Fair, where the entertainment was seen by the Prince and Princess of Wales in August 1929. They first collaborated in 1727, continuing to 1732. The Venetian Lady’s Machine, described in the first text, was a kind of diorama with a picture that scrolled past the viewer. 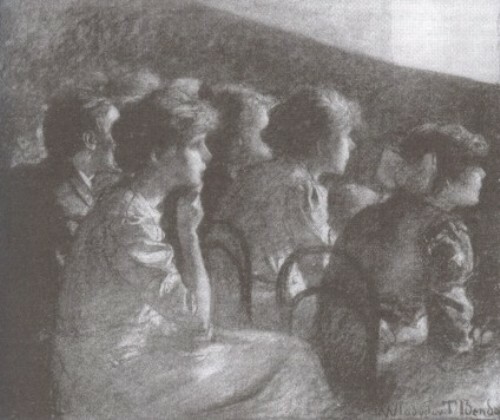 ‘The Grand Theatre of the Muses’, first advertised in 1728, was a combination of motion and music through ingenious use of clockwork, which likewise gave its audiences an early impression of motion pictures. 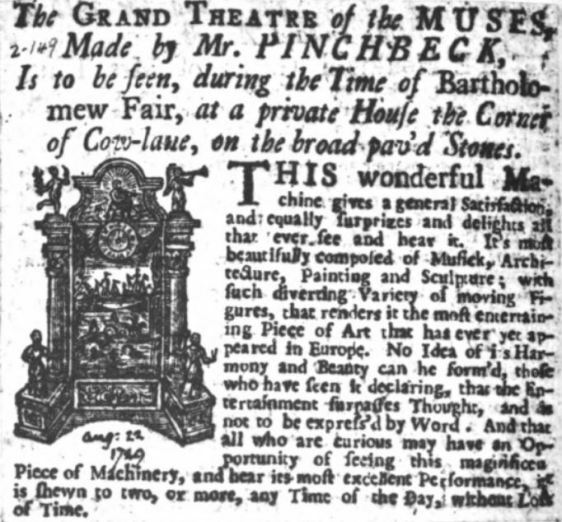 I have not found an eye-witness account of Pinchbeck and Fawkes’ work, but advertisements such as these give an indication of the wonder with which it was probably viewed. This entry was posted in 1720s, Advertisements, Newspapers, United Kingdom and tagged Automata, London. Bookmark the permalink.